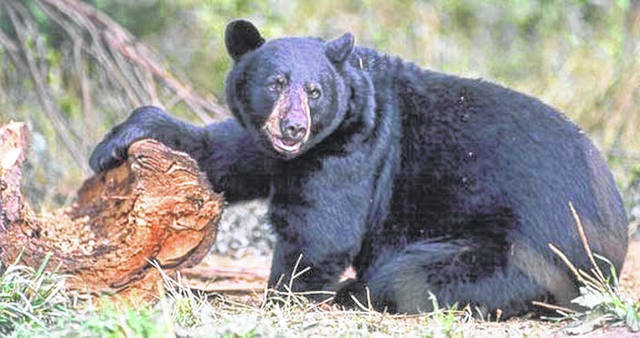 Otway-Black bear sightings are increasing in Ohio and the Scioto Brush Creek watershed. These large predators were extirpated from the state by the 1800’s. However black bear are once again being captured on trail cameras by outdoorsmen and nature enthusiasts in Ohio and Scioto County. The Friends of Scioto Brush Creek, Inc. would like to invite everyone to join us for a community gathering and program on the black bear population of Ohio and how we can learn to live safely with our newest bruin neighbor. A potluck luncheon will follow the program so bring a dish to share and meet others interested in conservation and watershed protection. Guest speaker will be Dr. Suzanne Prange. She received her B.S. and M.S. in Biology from the University of South Alabama and her Ph.D. in Wildlife Biology from the University of Missouri. She also completed post-doctoral training at The Ohio State University and was employed by the Ohio Division of Wildlife where she served as the state’s Furbearer Biologist for over 10 years. The majority of her recent research has been dedicated to threatened and endangered forest wildlife species, especially black bear and bobcats. In addition she has worked with a number of carnivore species, authoring over two dozen peer-reviewed papers. She has served on several executive boards and committees within The Wildlife Society and the American Society of Mammalogists. Currently, she is dedicated to independent wildlife conservation research in Ohio’s Appalachian region. Contact Jody with any questions at fosbc@scpwildblue.com or 740-493-3062. What: The Friends of Scioto Brush Creek’s Annual Community Gathering and Covered Dish Luncheon. Please bring your favorite dish to share. Where: Union Township Community Building, beside the Union Township Volunteer Fire Department, 50 Arion Road at the intersection of St. Rt. 73. Parking and meeting room entrance at the rear of building. The Friends of Scioto Brush Creek, Inc. is an all volunteer organization whose mission is to maintain and improve the water quality of Scioto Brush Creek through education, awareness and involvement of local residents.